Peoples Democratic Party members at the National Assembly have hit back at President Muhammadu Buhari over his comment that looters would not return to power in 2019. 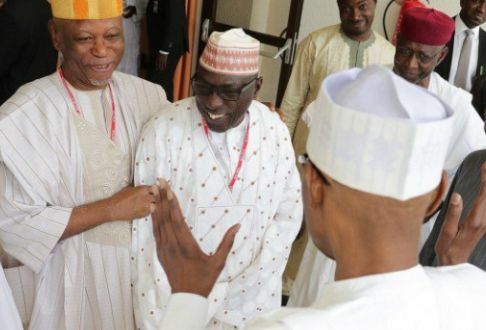 The President, in a veiled reference to the PDP, was quoted to have made the statement on Thursday, at an interactive session with community leaders and stakeholders in Kano. He had said, “Those who ruled Nigeria without vision and looted the nation’s treasury are the same people boasting that they will displace the APC government and return to office. But the PDP caucus in the House of Representatives, on Saturday, stated that Buhari was a major beneficiary of funds allegedly looted by PDP leaders. The Deputy Minority Whip of the House, Mrs. Binta Bello, who spoke for the caucus, summed up the views of the PDP, saying that Buhari should rather apologise to Nigerians “for being unable to fulfil his campaign promises”, instead of attacking the PDP. Bello, in an interview with Punch, recalled that in all his previous outings before 2015, Buhari was unable to win the Presidency because he never had a robust campaign. She said, “He (Buhari) has the right to attack us and we have the right to criticise him too by telling him the truth. That is the beauty of democracy. “The people he now calls looters were the same people who funded his campaign in 2015. “His campaign in 2015 was different from his campaign in previous years. In 2015, he had all the money to spend. The looters, who left the PDP, gave him the money. Why didn’t he reject it or tell Nigerians how he raised the campaign money? “Let’s face the facts, the President has failed in delivering his campaign promises. Where is the 2017 budget? What can he boast to have achieved in terms of implementing the budget? At the senate, members of the PDP caucus, including principal officers of the chamber, said the ruling APC was now made up of those Buhari referred to as looters. They further said the ex-PDP members in the APC had continued the alleged looting in the current administration. In his remarks, Senator Samuel Anyanwu described Buhari’s comment as far from the truth. Also, Senator Mathew Urhoghide disagreed with Buhari. “I don’t agree with the President because 80 per cent of the looters in the then PDP government are now with the President in APC and are still looting and others are waiting to loot,” he said. The Minority Whip, Senator Phillip Aduda (FCT), said victory at the 2019 elections was “in the hands of God” and not as the President boasted. The Deputy Minority Whip, Senator Abiodun Olujimi, also dismissed Buhari’s claim as false.